Pure coconut oil, with Henna, Amla and Lemon. 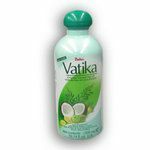 Vatika is a premium coconut hair oil enriched with Henna, Amla, Lemon and six other trusted herbs. Vatika's unique natural formulation ensures deeper oil penetration to give your hair and scalp complete nourishment for problem free, healthy hair. Henna, along with other herbs, coat your hair, protects it from oxidation, maintaining it's natural color. Amla strengthens the root of your hair to maintain their health and natural thickness. The astringent action of Lemon controls sebum flow. Directions for use. Apply Vatika hair oil regularly to your scalp and hair. For best results, leave it on overnight. Coconut oil (cocos nucifera oil), neem (Azadirachta indica leaf extract), brahmi (centella asiatica plan extract), fruit extracts of amla, bahera and harar (extracts of emblica officinalis, terminalia belirica and terminalia chebula), henna (lawsonia inermis leaf extract). Milk (lac), rosemary oil, lemon oil, TBQH, Fragrance.